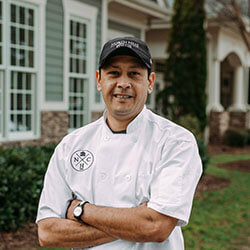 Originally from Guanajuato, Mexico, Edgar joins North Hills Club with a rich culinary background. He worked at Club Corp of America Carolina Club in Chapel Hill from 1998-2015, becoming their Sous Chef for his last eight years there. He then began working at Governor’s Club in Chapel Hill as the Banquet Chef from 2015-2019. Edgar joined NHC as Sous Chef in 2019 and is a NY Yankees, Raiders, and Tar Heels fan. He enjoys spending time with his family by dining in local restaurants and going outdoors. He and his wife, Liz, have three children: Brian, Lilah, and Zoe.